Il sensore TPA81 e' costituito da una matrice di sensori sensibili alla gamma, infrarossa, in un range che va dai 2um ai 22um. La banda e' simile a quella rilevata dai sensori PIR che si trovano negli allarmi / antifurto o nei dispositivi che accendono le luci. La caratteristica di questi sensori, e' che possono rilevare soltanto il movimento degli oggetti, e questo li rende limitati nel settore della robotica. Ad esempio, non possono essere utilizzati per misurare la temperatura di una sorgente calda statica. Un tipo differente di sensori sono i 'thermopile array'. Questi vengono utilizzati nei misuratori di temperatura all'infrarosso, che non richiedono il contatto con la sorgente da misurare. Hanno un ampio campo di rilevamento di circa 100? e spesso sono utilizzati con una lente che restringa il campo di misura a circa 12?, molto piu' utile in un'applicazione di misura. Recentemente sono disponibili sul mercato dei sensori dotati di lenti al silicone, questo e' il tipo utilizzato nel TPA81. Il TPA81 puo' misurare la temperatura di 8 punti adiacenti, contemporaneamente. Puo' anche controllare un servo per muovere, sull'asse orizzontale, il sensore e costruire una immagine dei valori termici rilevati. il TPA81 riesce ad individuare la fiamma di una candela a 2 metri di distanza ed e' insensibile alla luce ambientale. The typical field of view of the TPA81 is 41° by 6° making each of the eight pixels 5.12° by 6°. The array of eight pixels is orientated along the length of the PCB - that's from top to bottom in the diagram below. Pixel number one is nearest the tab on the sensor - or at the bottom in the diagram below. detectable. At 0.6 meter (2ft) its around 64°C. At 0.3 meter (1ft) its 100°C+. added to the back ground ambient - not swamped by it. A human at 2 meters will show up as around 29°C with a background 20°C ambient. All communication with the TPA81 is via the I2C bus. If you are unfamiliar with the I2C bus, there is a tutorial which will help. The TPA81 uses our standard I2C 5 pin connection layout. The "Do Not Connect" pin should be left unconnected. It is actually the CPU MCLR line and is used once only in our workshop to program the PIC16F88 on-board after assembly, and has an internal pull-up resistor. The SCL and SDA lines should each have a pull-up resistor to +5v somewhere on the I2C bus. You only need one pair of resistors, not a pair for every module. They are normally located with the bus master rather than the slaves. The TPA81 is always a slave - never a bus master. If you need them, I recommend 1.8k resistors. 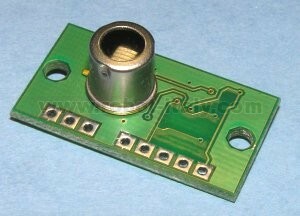 Some modules such as the OOPic already have pull-up resistors and you do not need to add any more. A servo port will connect directly to a standard RC servo and is powered from the modules 5v supply. We use an HS311. 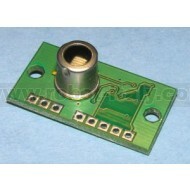 Commands can be sent to the TPA81 to position the servo, the servo pulses are generated by the TPA81 module. The TPA81 appears as a set of 10 registers. Only registers 0, 1, 2 and 3 can be written to. Register 0 is the command register and is used to set the servo position and also when changing the TPA81's I2C address. It cannot be read. Reading from register 0 returns the TPA81 software revision. Registers 1, 2 and 3, are used for calibration of the sensor. Do not write to these registers or the sensors calibration data may erased. (There is protection against this, in that a specific 3 byte command sequence similar to the I2C address change sequence, has to provided to enable calibration mode). Calibration requires the use of two temperature controlled black body heat sources, unless you have these, you will not be able to calibrate the module. All modules are calibrated in our workshop as part of the testing process. There are 9 temperature readings available, all in degrees centigrade (°C). Register 1 is the ambient temperature as measured within the sensor. Registers 2-9 are the 8 pixel temperatures. Temperature acquisition is continuously performed and the readings will be correct approx 40mS after the sensor points to a new position. Commands 0 to 31 set the servo position. There are 32 steps (0-31) which typically represent 180° rotation on a Hitec HS311 servo. The calculation is SERVO_POS*60+540uS. So the range of the servo pulse is 0.54mS to 2.4mS in 60uS steps. Writing any other value to the command register will stop the servo pulses. To change the I2C address of the TPA81 you must have only one module on the bus. Write the 3 sequence commands in the correct order followed by the address. Example; to change the address of a TPA81 currently at 0xD0 (the default shipped address) to 0xD2, write the following to address 0xD0; (0xA0, 0xAA, 0xA5, 0xD2 ). These commands must be sent in the correct sequence to change the I2C address, additionally, No other command may be issued in the middle of the sequence. The sequence must be sent to the command register at location 0, which means 4 separate write transactions on the I2C bus. Additionally, there MUST be a delay of at least 50mS between the writing of each byte of the address change sequence. When done, you should label the sensor with its address, if you lose track of the module addresses, the only way to find out what it is to search all the addresses one at a time and see which one responds. The TPA81 can be set to any of eight I2C addresses - 0xD0, 0xD2, 0xD4, 0xD6, 0xD8, 0xDA, 0xDC, 0xDE. The factory default shipped address is 0xD0.